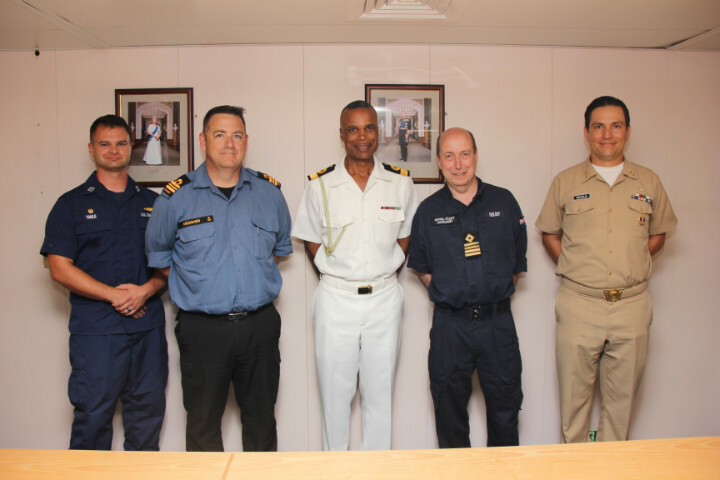 Coral Harbour Base, (RBDF): Commander Defence Force, Commodore Tellis Bethel, paid a courtesy call on four commanding officers of foreign military and auxiliary vessels on 13th June 2018. The officers and their vessels are participating in Exercise Tradewinds. Commodore Bethel greeted the officers aboard the Royal Fleet Auxillary (RFA) Landing Ship Mount Bay in his capacity as Chief of Defence Staff for Exercise Tradewinds. RFA Mount Bay is commanded by Captain Peter Selby and is moored at Prince George Wharf. Also aboard the RFA Mount Bay were: Lieutenant Commander Scott Meagher, Commanding Officer, Her Majesty’s Canadian Ship Shawinigan; Lieutenant Benjamin Yahle, Commanding Officer, United States Coast Guard Cutter Charles David Jr., and Commander Enrique Leon Novelo, Commanding Officer, Oaxaca Class, Mexican Offshore Patrol Vessel ARM Oaxaca, named after the Mexican State. The visiting ships are in Nassau Harbour, and will be in country for the duration of Exercise Tradewinds, which commences on Thursday June 14 and culminates on June 21st at HMBS Coral Harbour. The Royal Bahamas Defence Force is hosting the annual regional training exercise with approximately 800 participants from 22 nations. The exercise involves ships, aircraft, ground troops and law enforcement personnel engaged in training focused on countering transnational organized crime.